Such nuances and shifts in the music of a patient's voice have long been familiar to clinicians. Indeed, as Steven Knoblauch observes, the music of psychotherapy has been acknowledged across a variety of theoretical orientations, from Freudian to self-psychological to interpersonal and relational perspectives. In The Musical Edge of Therapeutic Dialogue, Knoblauch provides a model of "resonant minding" in which the musical elements of speech become a major source of information about unconscious communication and action. More specifically, resonant minding, by distinguishing between discrete and continuous levels of communication, between the verbal and the musical, offers a way of accessing and affecting levels of unconscious interactive process by attending to the musical edge of dialogue -- provided only that we can hear it. Drawing on detailed clinical vignettes, he explores shifts in embodied dimensions of musical expression including rhythm, tone, pauses and accents across a sequence of patient-therapist interactions in order to show how the dyadic logic of mutual improvisation operates at the periphery to guide the continuous flow of unconscious communication and mutual regulation. In so doing, Knoblauch provides a vivid sense of how the shifting movement of the patient's "solo performance" can be facilitated and enriched by the creative "accompaniment" of the therapist. 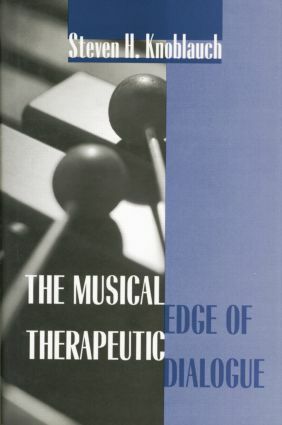 Ultimately, Knoblauch argues, the music of therapy is not only another road to the unconscious, but one uniquely able to convey emergent meanings in a variety of domains, from conflicting cultural identifications to the experience of the body to the emergence of desire. His vision of mutual immersion in a shared "performance" aimed at fostering growth coalesces into a major contribution - at once evocative and clinically consequential - to the current movement to grasp nonverbal behavior and processes of mutual regulation as they enter into all effective psychotherapy. "Analytic therapists have long known that the messages conveyed by both partners in the therapeutic dialogue contain far more than verbal text. Now Steven Knoblauch explicates and illustrates exactly how issues of tone, pitch, rhythm, accent, and pause enter into our work. His special quality as a writer shines through in the richness of the clinical examples that illuminate every page. Never have the metaphors of music received such expressive application to treatment. The Musical Edge of Therapeutic Dialogue opens the reader to an expanded appreciation of the substrate of empathy and introspection." "Over the course of the last decade, it has become apparent just how profoundly personal the practice of psychoanalysis is. For each of us, clinical work closely reflects personal history, aesthetic and intellectual sensibility, one's take on life. Drawing on his deep understanding of and love for jazz, Steven Knoblauch has written a beautiful book about the subtle, interactive textures of the analytic process, its rhythmic patterns as well as its semantics, its tones as well as its symbols. For anyone who struggles daily with the enormous complexities of analytic work, The Musical Edge of Therapeutic Dialogue offers, like a good piece of music, an enriching experience." "An enjoyable aspect of this book is that the flow of Knoblauch's writing harmonizes with his ideas. He establishes a musical rhythm in his case illustrations such that the material comes alive, and the reader can easily accompany him. The music of his writing captures the lapses, withdrawals, and drawing close of intimate relations." "The applicability of his musical notions to the therapeutic craft is completely convincing to the classical-music-oriented connoisseur. Therapists of other (or less artistic) preferences may reframe his notions in terms more comfortable to them but will surely benefit from the wisdom and depth of the treatment formulations carried in this volume." Listening to the Rhythm. Listening to the Tone. Improvisation and Accompaniment. The Unspoken Dialogue. From the Individual Notes to the Expanding Composition. Mind Metaphors. Play and Interplay: The Counterpoint of Subjective Bodies and Experiencing Desire. Listening to the Dialogue of Harmony and Dissonance. Coda. Steven H. Knoblauch, Ph.D., is a faculty member and supervisor at the New York University Postdoctoral Program in Psychotherapy and Psychoanalysis and the Institute for the Psychoanalytic Study of Subjectivity in New York City, The Institute for Contemporary Psychotherapy, and The Psychoanalytic Psychotherapy Study Center, all in New York City. In his early 20s, Dr. Knoblauch pursued a dual career in community mental health and as a jazz musician. He entered psychoanalytic training 17 years later and has endeavored to integrate his musical experience into his clinical practice.